Leighton Hire Centre Ltd now supply standard cold wash chemical toilets. We clean all toilets on a weekly basis and take pride in maintaining excellent cleanliness. We have our own toilet cleaning van in order to achieve the high standards we and our customers expect. We have taken on this roll with supplying our own toilets due to numerous suppliers not cleaning the units to how we and our customers would like to find them. Toilet rolls are topped up weekly and included in the price with the clean. 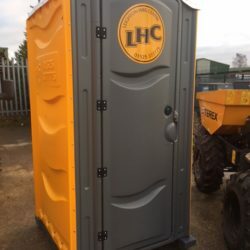 Our toilets are suitable for construction sites, private builds, parties, events and much more, so please call us today to obtain a quote. Please note that there is a minimum hire charge of 4 weeks.